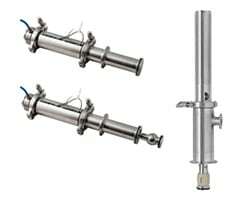 The SSB Retractor is used for cleaning different types of installations from simple tanks and duct work, to complex process applications with agitators where built-in dynamic cleaning heads are impractical to use. The Toftejorg SaniMidget Retractor is available with two styles of retracting mechanisms: Pneumatic Driven, which uses air pressure to extend and retract the cleaning head, and Media Driven, which uses the pressure of the cleaning media to extend the cleaning head and an integrated spring to retract it. The Rotary Spray Head creates a fan of fluid in a swirling pattern. The distribution pattern of the cleaner head generates a vibrating impact as well as cascading flow coverage of all internal surfaces of the tank.